The first piece of advise, is to set page guides where needed (in the Page menu, you can put them at a certain numerical place, and then move them along) and then Snap to guides in the same menu. This way, you can move everything into the correct place and align perfectly. The second advice, is to work with low resolution&image visible settings for embedded images. 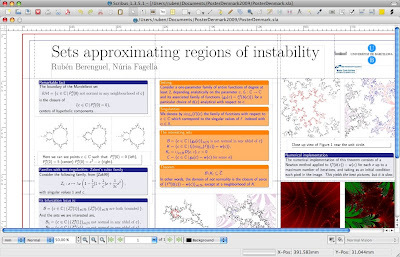 In my poster, everything except the main title were embedded images (PS for the LaTeX output, PNG for the images), thus the draw time was really long. I also sat the DPI of all non-PS images at at least 400. I wanted a nice print. This setup generates just a "block piece", which could also be a Theorem piece (if you have already Beamer-ized something you know what I mean). You need to generate as many .tex files as "pieces" in your poster, and then generate Postscript files for them. In the current version of Scribus, it is better to use Postscript files and the Postscrit filter to PDF export than embedding PDF's. At least in my tries..., I guess they will solve it soon.